Wesco Cedar carries a broad range of products to server your needs. From roof to deck in any climate we have the wood to suit any application. For our treated products we use the navigation on the left to find your product. 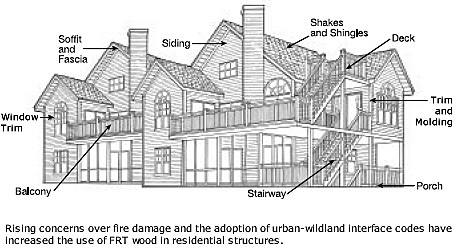 FRX® fire retardant treated wood may be used in exterior applications permitted by the codes where: public safety is critical, other materials would transfer heat or allow fires to spread, sprinkler systems cannot easily be installed, corrosive atmospheres necessitate excessive maintenance of other materials, or fire protection is inadequate or note readily available. The international Building, Residential and Urban-Wildland Interface Codes and regulations, permit the use of fire retardant treated wood in specific instances. See below for typical residential uses. Wesco maintains a large inventory of untreated cedar shakes and shingles. We can supply any type of cedar shakes or shingles necessary to meet specifications required for any roofing or siding job.